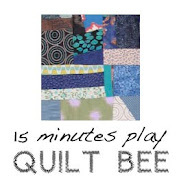 15 minutes play...BumbleBeans Inc.: NEW CHALLENGE!!! 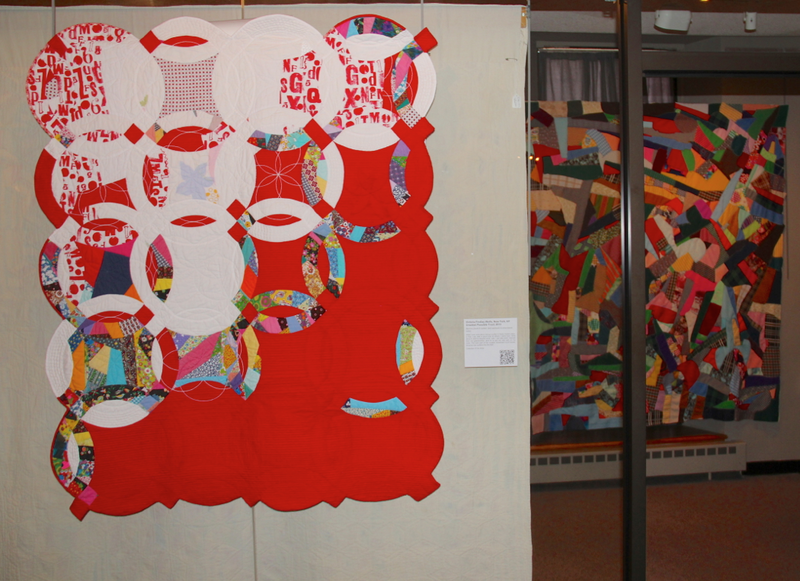 Then this past weekend, as I sat listening to a talk at the New England Quilt Museum, Where I have one of mine and one of my grandmother's quilts hanging, I had the AHA moment. "Greatest Possible Trust" by Victoria Findlay Wolfe, foreground. 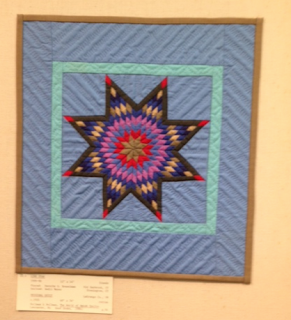 and Background, Elda Wolfe's Quilt, (my late grandmother!) My quilt was inspired by looking at hers...at the New England Quilt Museum now. 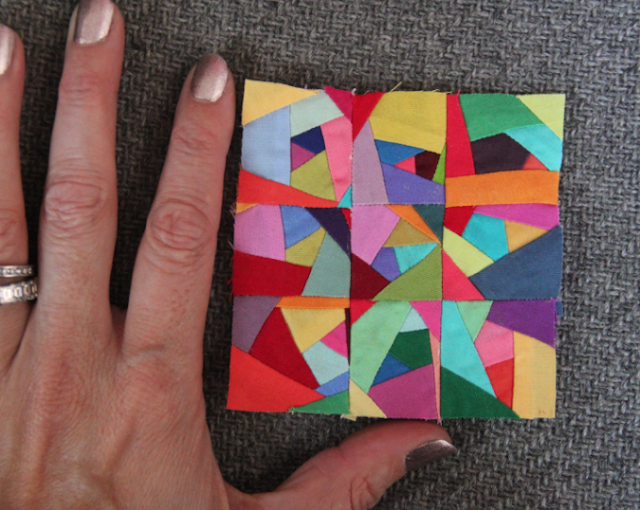 a 12" square quilt, using "MADE FABRIC" in MINIATURE! "Oh, I love to use my tiny pieces!" 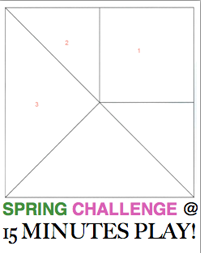 So this is a great challenge for you! And for all those that say, how small is to small? Now we know how to answer that question! 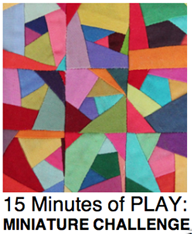 You can use WHATEVER you want... Just focus on a finished size of 12" finished quilt. 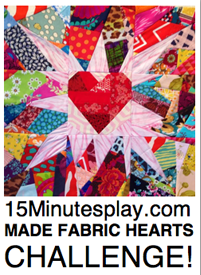 Work small, and see just what you can do with your itty bitty scraps! If you need guidance you can find this tutorial of mine here. They might it make a great gift! So are you in? Comment here! PERFECT! 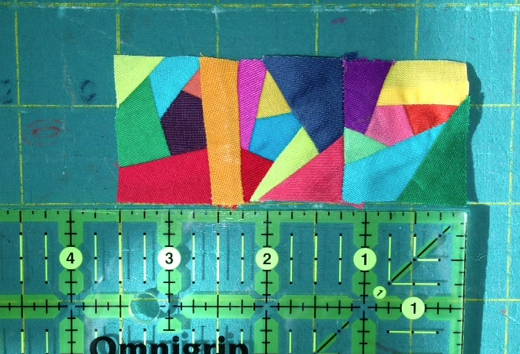 I am just finishing up a lap quilt...christmas trees in solids and I have a TON of little pieces! I'm going for it! A 12" mini would make a perfect table topper or pillow top! Thanks for the idea!!! 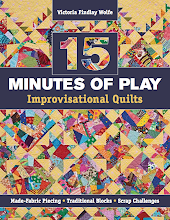 i just spent the day machine quilting (I finished! 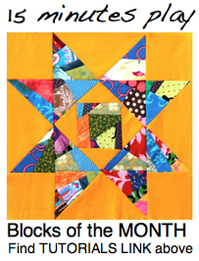 yay) and am too tired to start the binding but looking for something to do...this fits the bill...count me in! I LOVE this type of piecing. It's so mindless and beautiful. 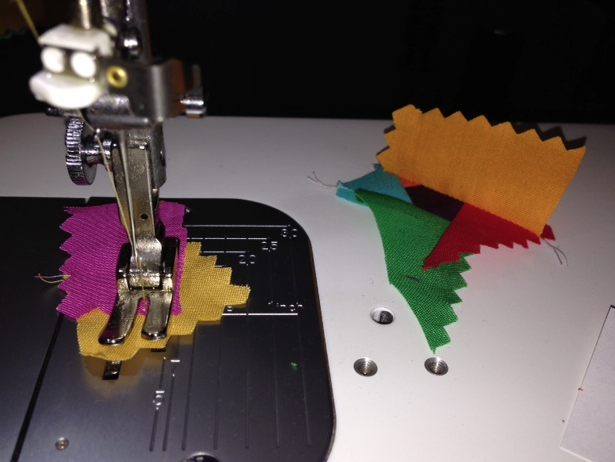 I do use a tiny seam allowance, 1/8" then 1/4" to join sections. Smaller stitch length. This sounds so fun! You are so inspiring, I can't wait to start this. I have a bunch of silk pieces, maybe I'll try that.... oh yippee! I'm in! I have a ton of small solid scraps. Looking forward to seeing what everyone comes up with. I'm in! I already stared making fabric on a small scale. Now I know what to use it in! Love this idea! I'm in, too! Oh Yey! Count me IN! Turning the teeniest of scraps into something fun is one of my secret passions (ok...maybe not so secret now! lol). Sorry,but what does MADE fabric mean? this sounds like loads of fun! I have boxes of little pieces!!! I just put together a bag of crumbs after cleaning up my sewing area! Perfect. I'm in!! Another great challenge - thanks Victoria! This sounds like great fun! I am going to try to make time to play and see what I can do. I would love to participate in this challenge. I am always using tiny scraps and would love to do this! Count me in. 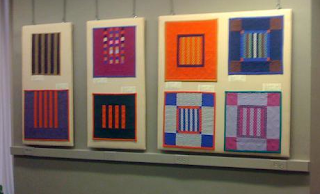 I loved those mini quilts. Can't wait to make one. 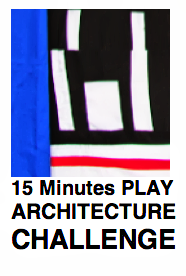 Count me in on this challenge!!! Just love those miniature Amish quilts. 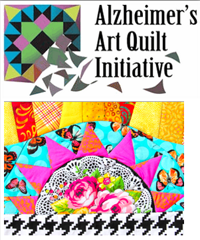 This challenge is right up my alley so hope to find time to make something. I have heaps of 4" squares made from small crumbs but may leave those for now and try something different. Can't resist this challenge! Hmmmm....will I do it in silks or Cherrywoods?? For those of us who email our submissons, use the contact link you posted? Or..? Great idea, Victoria, I was going to do that huge pile of ironing this afternoon, but now....! Nothing is too small for me! I am IN IN IN!!! I'm in, the smaller the better! 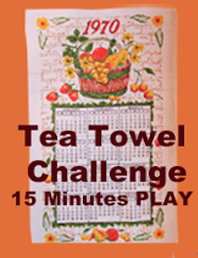 Yay..I like this challenge and I have a ton of crumbs to play with so lets do it! New definition to: teeny weeny WOW! I am in too and i know just what i will be making! i wish all of you happy sewing! cannot wait to see what you all come up with! Haven't made a mini since early in my journey ( I thought small was easier...geez). I am going to take some time and see if I can just play with it! Oh fun! I have multiple little bins of TINY scraps... always looking for more things to make with them. Love the 12" size limit, too. Playing with this will be a nice reward for completing a Double Wedding Ring challenge WIP, and give me something fun to think about while sewing the binding and sleeve on the bigger one. The tiny ones are so cute and pretty. I'm working on a scrappy grey quilt and having lots of little pieces leftover. I also have a scrap bag of solids. I will make something out of one of these. Digging out my Amish quilt books for inspiration. Love love love this challenge. I'm in and already done!